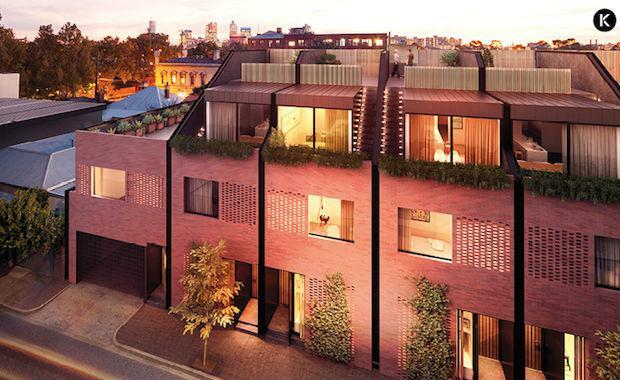 The complete sell out of Melbourne developer, Kalex's latest project, Park and Raphael, has solidified the team in the local market. Park and Raphael is a collaborated with some of Melbourne's most creative design talents; Architecture is by award-winning practice Jackson Clements Burrows (JCB), interiors are by respected studio DesignOffice, furniture hails from experts Great Dane Furniture and landscaping is by progressive duo Urban Commons. “It's not about just an object for its own sake, we try to make sense of the location generally and offer something that consolidates itself with the past but also suggests possibilities for the future,” Jackson said. Kalex teamed up with DesignOffice for the projects interiors, where each detail has been perfectly selected. Mark Simpson said that DesignOffice believes the most important thing for them is understanding someone's brief. “A lot of the discussions we engaged in were about actually responding to the way that people live,” Mr Simpson said. “The design of the kitchens have come about as a result of a brief about contemporary lifestyle and they're designed in response to the increased importance [that] cooking and food and communication, and conviviality have all become as part of peoples lives. Kalex is a developer led by design. Founded in 2002, this Melbourne based developer is passionate about collaborating with local talent to create amazing spaces. The love for their craft is shown in their diverse portfolio, from commercial to residential and everything in between. Managing Director, Kyp Bosci founded Kalex when he was in his late 20s with a decade of work on public and private projects with developers under his belt. Now 39, he believes that his experience and track record of raising capital have played an important role, but helped push him to do work on what he truly wants to. “I knew early on I wanted to do private projects rather than working on clunky corporates,” Bosci told the Australian. Bosci's passion for design in obvious in every project Kalex completes, and he strives to make each space excel. “It's all about the occupant, creating a great space for the occupant, and then all of the other fundamentals flow out of that,” Kyp Bosci said. The Kalex crew all share Bosci's vision, Co-founder Liam Wallis loves working on the finer details. “For us, it's about the simple things done well,” Liam Wallis said. This energetic company thrives on delivering unique spaces through their passion for design and collaboration. Kalex is already looking ahead at their next big challenge, their 166 Gertrude Street project boasts a contemporary yet classics style that will be confident and unapologetic, yet, respectful. Kalex are accepting registers of interest of 166 Gertrude Street today.